Inelegant and tedious, Xenoblade Chronicles 2 is the anti-Nintendo game. In a year full of triumphs for the spunky Switch, this massive role-playing game is a disappointment. I didn’t love the first Xenoblade Chronicles, a 2010 Wii game from veteran director Tetsuya Takahashi and his team at Monolith Soft. I hated the boring do-gooder Shulk and his dull screeching about the power of the Monado, and the world’s impressive scale didn’t make up for its rote combat system. I skipped 2015’s Xenoblade Chronicles X but have been looking forward to Xenoblade 2 for a while, in hopes that the man behind Xenogears, one of my favorite games of all time, might have returned to form. It brings me no joy to report that he has not. 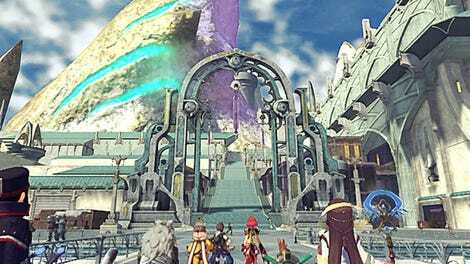 Xenoblade 2 is set within a world called Alrest, where humans reside on top of monstrous creatures called Titans who float atop an infinite sea of clouds. These Titans won’t hold up forever, though, and there’s a lingering sense that once they fall, humanity is doomed. Our hero, Rex, is a blandly nice salvager whose job is to dive into the clouds and scour for loot, which he exchanges for cash and then sends back home to his village. Because he’s just that nice. 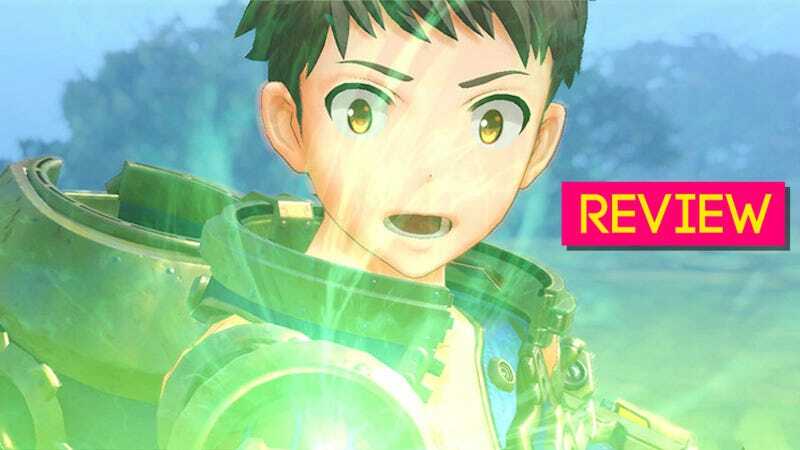 One day, Rex accepts a mysterious mission and finds himself irreversibly linked to Pyra, a voluptuous woman who is also a sword. She’s what’s called a Blade, which in Xenoblade parlance means she is a weapon that can be controlled by Rex, who is now called a Driver. Pyra wants Rex to help her find Elysium, a rumored paradise that could help save mankind by giving them someplace to live after all the Titans collapse. Rex is into it, because again, he’s just that nice. Yes, that’s really Pyra’s outfit. As the game goes on, cracks start to show. Xenoblade 2 will barrage you with combat tutorials full of proper nouns, telling you how to perform Driver Combos, Elemental Combos, and Fusion Combos, among many of the game’s other confusingly named mechanics. Most of the tutorials are explained poorly, and if you don’t immediately grasp what they’re trying to tell you, you’re screwed, because there’s no way to revisit them. Learning how the battle system actually works requires lots of experimentation or, more likely, a good online YouTube tutorial. You have to select the right attacks at the right time in the right order, and if you get them correct, you can do a lot of extra damage to enemies. It’s chaotic and messy, sometimes satisfying, but often repetitive, because every battle takes way too long. Xenoblade 2 caps off a killer first year for the Nintendo Switch, yet I found it in many ways to be an anti-Nintendo game. It’d of course be unfair to directly compare Xenoblade 2 to the likes of Super Mario Odyssey, but there’s an interesting contrast to be made between Monolith’s RPG and Nintendo’s other big games. Mario, Zelda: Breath of the Wild, and even Splatoon 2 are masterful at presenting the player with a deck of mechanics and escalating over time, teaching you how to play not with trial-and-error but with precision. Super Mario Odyssey takes a few verbs—jumping, possessing—and ekes out as many challenges as possible from each one. Breath of the Wild, a game on which Monolith Soft actually contributed development support, is careful to teach you how to use each of Link’s core abilities before it lets you proceed. Xenoblade 2, in contrast, is a mess. It constantly introduces new ideas, never stopping to let you breathe or sort through the chaos. Combat is a blur of nouns, colors, and bad camera angles. It may be a Switch exclusive, but it’s the antithesis of Nintendo’s classic design principles. A typical glimpse of combat in Xenoblade Chronicles 2, which is messy, chaotic, and overwhelming. Early on you’ll meet Tora, who is one of the most irritating characters I’ve ever encountered in a video game. Tora is a Nopon, which is sort of like a cross between an egg and a Minion. Like other Nopons, he skips over words and gratingly speaks about himself in third-person. He’s obsessed with maids and seemingly unable to use proper English. During cutscenes and battles, he is constantly screaming his catchphrase—“Meh-meh!”—which is precisely as endearing as it sounds. Tora, a Nopon, is one of the worst characters in recent RPG history. The other characters aren’t much better, thanks to an unsubtle script that stomps all over even the most interesting story scenes. “We’ll beat them with the power of friendship,” cries Rex during one early battle. Later, one character declares that “I think deep down Rex still misses his mother a little,” a reference to the hero’s mom having passed away before the events of the game. Huh. Hard to imagine that someone might miss their departed mother, deep down. During one early dungeon, you’ll fight a dozen battles with guards who repeat two lines every time they swing: “Think you can take me?” and “Don’t forget me!” The English script, handled by Nintendo of Europe rather than Nintendo’s talented Treehouse group, is full of that kind of stilted, unnatural dialogue. The voice acting ranges from passable to painful, especially during combat. One lowlight, a pair of villains named Patrokha and Mikhail, sound as if their actors didn’t understand a word they were saying. The story takes some interesting turns in the latter half of the game, when Xenoblade 2 starts asking questions about memory and human nature. Blades can’t die, but when their Drivers are killed, those Blades will revert to a “reset” state, forgetting everything they knew before. It’s a cool idea that makes for some intriguing twists and turns. Each of the game’s gargantuan Titans has its own culture and attendant politics, which helps the world feel believable and interesting. Throughout the game, Rex and crew have to track down the shadowy group of mercenaries that’s trying to manipulate them all. The moment-to-moment dialogue never gets better, though. And it’s hard to take emotional cutscenes seriously when the camera spends so much time leering at the game’s various scantily clad women. During its most serious, emotional scenes, Xenoblade 2 is always careful to ensure the camera is in just the right place. Xenoblade 2 is also plagued with technical issues. I ran into several cutscene glitches in which the dialogue started getting scratchy, then desynchronized from the game entirely. My game hard-crashed twice, and at various points I had to stand around waiting to enter combat until my characters stopped jumping off cliffs and losing all their hit points. It looks great on a television but playing in the Switch’s undocked mode makes everything look smudged and blurry, as if Xenoblade 2 is trying to throw back to the PS2 era. This kind of sprawling JRPG is ideal for playing on the go, so it’s a shame it looks so much worse. The resolution takes a serious hit when you’re playing in handheld mode. Xenoblade 2 consistently displays a frustrating lack of respect for the player’s time. Everything takes significantly longer than it needs to, in part because the game contains such an overwhelming number of features. It can take dozens of minutes to navigate the clunky menus, sort through all of the characters’ upgrades, and manage a collection of Pokémon-like Blades. The mini-map is vague and often feels like it’s withholding information. There are no larger maps to be found, so you’ll have to rely upon UI markers to figure out where you need to go. Battles are long and tedious, and many of them dragged on even after I’d fully learned how the combat system worked. The otherwise satisfying battle combos became much less interesting after I had to repeat them on every bullet-spongey trash mob in my path. And when I wasn’t grinding levels or taking care of some of the game’s menial sidequests, boss fights often prevented me from making any progress, especially during those moments when Xenoblade 2 arbitrarily decides to limit the party to two characters as opposed to the standard three. The best complicated RPGs, like Baldur’s Gate or Final Fantasy Tactics, work because they are constantly letting players make interesting decisions. Xenoblade 2 is similarly dense and complex, but most of the decisions it asks you to make simply aren’t interesting. That’s both because it’s so bad at explaining itself and because the choices themselves just aren’t very good. It’s not clear why the extra step is necessary, but the elongated process has three effects: 1) It makes you feel less excited to find a special rare Aux Core, because you might not have the proper items to refine it; 2) It makes you feel like you can’t sell any of the thousands of random materials you’ll collect out of fear that you might need them later; and 3) It adds tedium to what should be a simple, easy process of deciding which Aux Cores to use on each Blade. If you want to be able to swap out those accessories, you’ll have to go through them all one-by-one at the store and make sure they’re all refined. What could be a fun and strategic upgrade process becomes drawn-out and boring. The game is loaded with that kind of bloat. You’ll have to collect and use Weapon Points (WP) to boost each character’s Arts, Skill Points (SP) to buff their “affinity abilities,” and Pouch Items to temporarily buff their stats. All of these proper nouns compound and congeal into a big mess. There are many upgrade systems but few interesting decisions; it’s all width, no depth. Take the WP system. Each of the game’s Blades is associated with a type of weapon—Pyra is a sword—and each of those weapons has four Arts, of which you can use three at a time. You can upgrade each of those Arts with WP, which you accumulate in battle. But because there are so few options, there’s no real choice to make—you have to gradually upgrade all three you want to use. And if you’re playing around with different types of Blades, you’ll have to do this for up to 14 different weapons, for each of your different characters. It’s a slow, tedious rhythm. In a similarly strange decision, Xenoblade 2 decides to fragment some of your party’s experience points—the ones you get from all those fetch quests, mostly—so that they’re only usable when you rest. You’ll gain levels from combat automatically, like in other JRPGs, but to use your “bonus experience,” you’ll have to stay at an inn and manually choose to level up each character. Presumably this is to give players an extra wrinkle if they want a more challenging game—there are no difficulty settings—but in practice, it’s superfluous. Leveling up at inns would be fine if it were the only way to progress your characters, as with camps in Final Fantasy XV, but as an addition to a system that otherwise works fine without it, it just makes everything feel more complicated. A brief list of mechanics I haven’t even mentioned includes: buying shops and gaining “development” levels in each region of the game, monitoring the levels of clouds to access special areas, and using your Blades’ “region abilities” to surpass obstacles on the field. And then there’s an entire system of sidequests, unlocked in Chapter 4, that lets you send some of your unused Blades as mercenaries on missions across the world. Just like everything else in the game, the process is boring and tedious. Every time one of your Blade squads return from a mission, you’ll have to button-mash through menu after menu as the game shows each member’s affinity abilities leveling up, one at a time. Between the drawn-out results sequence and the awful interface, a fun little diversion turned into an activity that I dreaded. "In a year full of hits for the Switch, this is a rare miss." Everything takes 100x longer than it should. The writing is subpar. None of the characters are particularly likable. Some of the problems I’ve outlined are substantial; others are trivial. Taken together, they make for an RPG that frustrates far more often than it delights. It does delight, though. The music, composed by Yasunori Mitsuda and others, is spectacular. Every region has its own sweeping musical theme that ebbs and flows not just based on where you walk, but whether it’s day or night. The guitar-heavy battle music is a real highlight, though it might make you want to to start a mosh pit in your living room (or on the toilet). I’d recommend lowering all of the characters’ voices, the better to let the good music drown out the bad dialogue. The world of Xenoblade 2 is similarly impressive, and often beautifully realized. All of the Titans look great, at least when you’re playing in docked mode, and there’s something to be said for a game in which there’s an entire kingdom within the stomach of a giant lizard. The game’s disparate regions go well beyond JRPG cliches, with bizarre architecture and surreal landscapes. Walking through the clouds and vistas never gets old. Xenoblade 2's character designs can be... a lot. It’s too bad there isn’t a better game beneath those lovely trappings. Like the world of Alrest, there’s very little holding up Xenoblade 2. It is dull, dreary, overly complicated, and unconcerned with wasting the player’s time. Life is just too short for that—even if you don’t live on a sea of sinking clouds.